Customer service and loyalty has always been important to us. 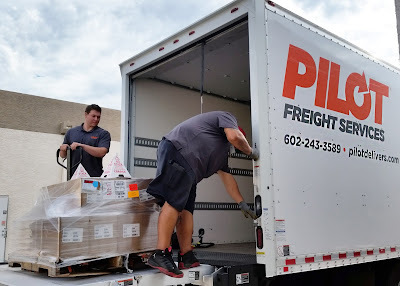 Therefore, when we were approached by past customers, Sheri and Sal Barbera of Sweetles, a publishing company for children’s books, to assist with a special delivery, we were happy to help. The couple was on a mission to donate over 1,000 copies of Sal’s book, “Mary Elizabeth the Spotless Cow,” to Arizona Helping Hands, a non-profit organization benefiting the state’s foster children. In need of a way to get the donations from the printing facility located in Brainerd, MN to Arizona Helping Hand’s headquarters in Scottsdale, AZ, Sheri turned to Pilot. After remembering her previous experience with Pilot and the value we placed on her customer as if they were our own, Sheri was confident we’d handle this delivery with the same special care. Tom Drake, VP, domestic/Canadian operations and traffic, and his team worked hard to ensure Arizona Helping Hands received the donations properly and I‘m happy to report we were even able to get them the books ahead of schedule. We take on every delivery with our customer’s best interest in mind and we couldn’t be more pleased to help donate our services to support such a momentous cause. Thanks to Sheri and Sal, the real heroes, for reaching back out to Pilot and allowing us to help make a difference!